We have 2 phones in low budget range, most of us are confuse about which phone to buy, “Redmi 5A or 10.or D”. Both of these phone offers very good hardware in low budget range. Pricing of both of these phone starts from INR: 4999/-. Redmi 5A (2 GB RAM/16 GB ROM) priced at 4999/-. Redmi 5A (3 GB RAM/32 GB ROM) priced at 6999/-. 10.or D (2 GB RAM/16 GB ROM) priced at 4999/-. 10.or D (3 GB RAM/32 GB ROM) priced at 5999/-. Here we have detailed comparison between these 2 phones. I hope it will help you to select one. Both of these displays are similar but size of 10.or D is little bigger. Resolution of display is also same i.e. 720p. Here we can say 10.or D is winner as it offers big display. Right now both of these phones are running on Android 7.1.2 Nougat operating system. Redmi 5A comes with custom user interface i.e. MIUI 9.0, where user will get lot of custom features along with few gestures, while 10.or D comes with stock user interface. Processor unit on both of these phones is same i.e. quad-croe Snapdragon 425 clocked at 1.4 GHz. 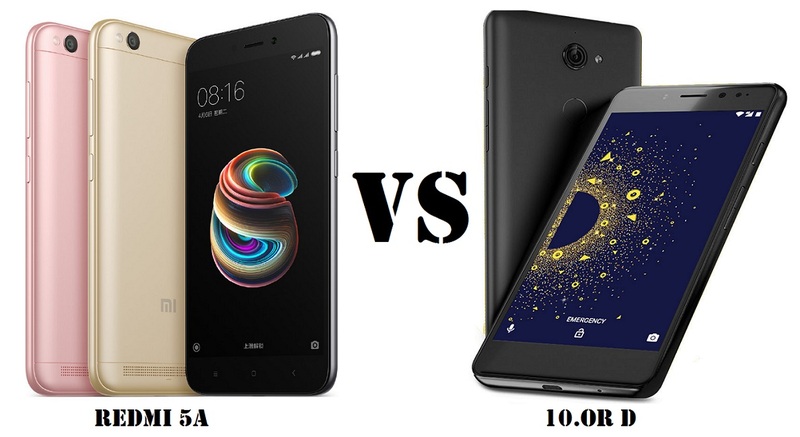 Performance of these phones is almost similar. Both of these phones are capable to do multi-tasking and gaming. Few high end games will lag due to high end graphics. Looking at RAM and storage, both offers similar storage variants. Both comes with advantage of dedicated slot for SD card to expand storage. Here you can use both SIM card along with SD card. 10.or D comes with big battery i.e. 3500 mAh, while Redmi 5A comes with 3000 mAh battery. Looking at this 10.or D will give us better backup on full charge, while we need to compromise with battery in Redmi 5A. Connectivity options on both phones are similar. Redmi 5A comes with advantage of IR blaster, where you can use your phone as universal remote. 10.Or D comes with advantage of fingerprint scanner. Both of these phones have there own advantages. Here Advantages of Redmi 5A over 10.or D are Phase detection auto focus (PDAF), IR blaster, MIUI Skin for customization. 10.or D also have lot of advantages over Redmi 5A i.e. big battery, fingerprint scanner, bigger display and stock UI experience. After this detailed comparison we can easily decide for one. Fingerprint scanner and battery of 10.or D are biggest advantage of 10.or D, which attracts the users more. If you think something left from my end, you can comment down below to help other users to select the better phone.